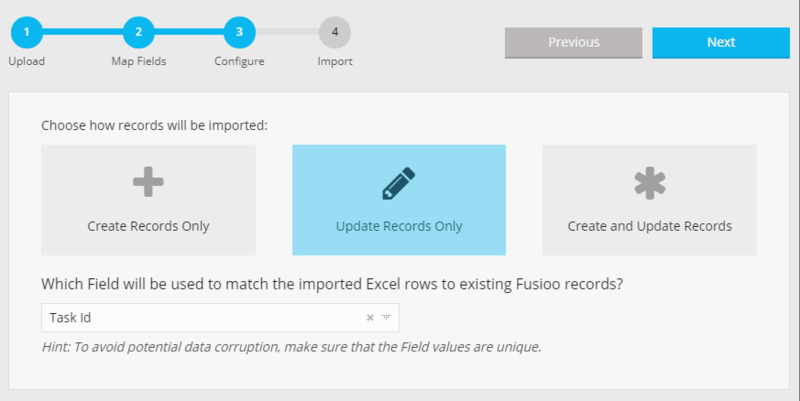 The import system will help you insert any existing records into Fusioo. If you have a Comma Separated Value (CSV) file, you might want to check how to convert it to an Excel file from here. Navigate to the Import page and select the App where you want to import your records. 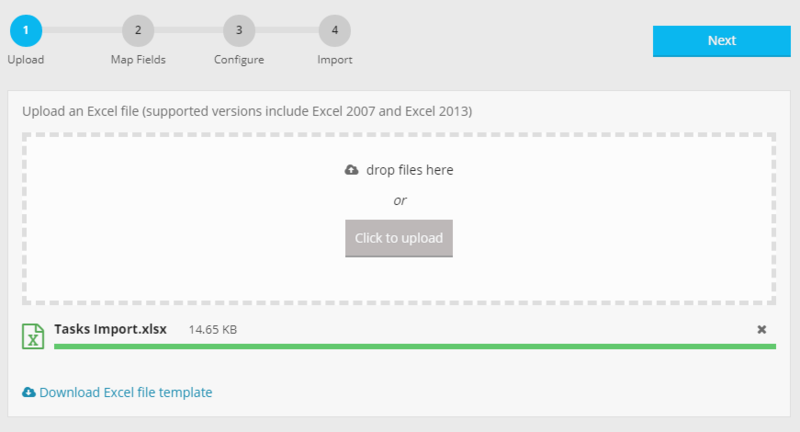 An Excel file template will be available for download. Insert the new record data into the downloaded Excel file. Make sure to enter valid data for each Field. Save and upload your Excel file into Fusioo. If the Excel column headers match the App Field names, then Fusioo will do the Field-Column mapping automatically. Double check and click Next. Note: Only mapped Fields will be updated. 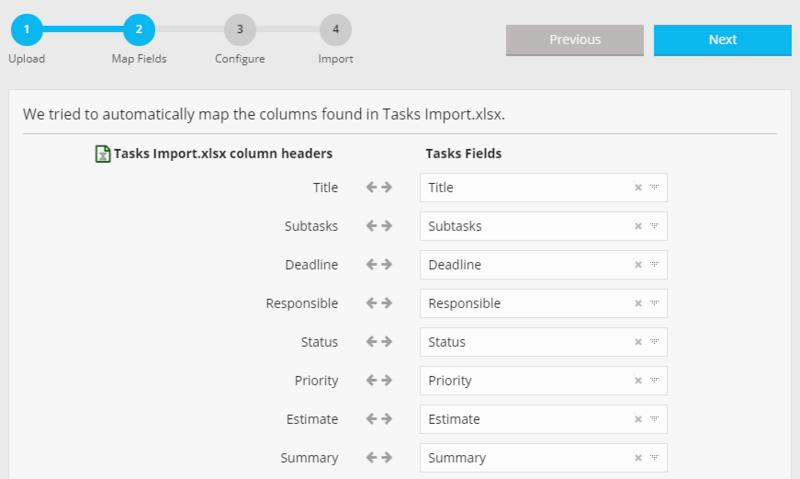 All non-mapped Fields will be skipped during the import process. Choose the type of import that needs to be performed. For further information on each import type, check this section. Import the records into Fusioo. You can choose from three different options when importing your data. For example, let's say you have these existing records in Fusioo. Let's see what happens when choosing different import options. 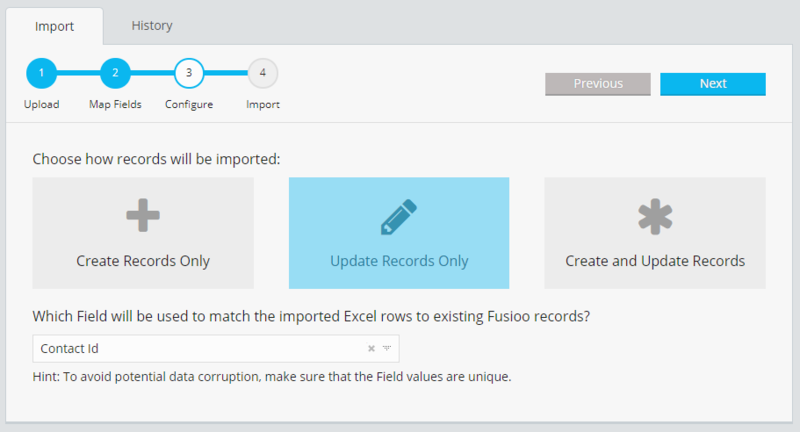 When you select this option, new Fusioo records will be created from the corresponding Excel rows. When you select this option, the imported Excel rows will update existing Fusioo records. This is ideal when you need to update multiple records efficiently. With this option you need to select a matching (unique) Field. This lets Fusioo know which record will be updated by the corresponding Excel file row. Fusioo uses case sensitive value matching. You only need to include the fields which you want to update in your import file. Other fields (even if they are set as required in Fusioo) don't have to be included in the import file. For Fields to be available in the "match rows by" dropdown, you will first need to map them to your Excel file columns. So let's say you import a record with the following values: 150, Mike and you match data by using the Contact Id Field. The imported row will match the record with Contact Id set as 150 and update the Name to Mike. In a different scenario, let's say you import this record 150, Gary, Jones and this time, you use the Name Field to match the records. Both records will get updated. This occurs because we used the Name Field as the match by Field and two contacts were named Gary. In most cases, the value of the match by Field needs to be unique - both in Fusioo and in the imported Excel file. This option is very similar to the Update Records Only option with one difference. Unmatched records will be created in Fusioo. For this reason, when you use this option, all of the required Fields in your App should be available in the imported file and mapped in the Map Fields step. Let's say that you import the following records and match by the Contact Id Field. The first record will update an existing record since the Contact Id matched. The second record is created since there weren't any existing records with a matching Contact Id. What are the accepted values for each Field type? Date Range: Accepts a text column in the following format: dd/mm/yyyy hh:mm|dd/mm/yyyy hh:mm. The first date represents the date 'from' and the second date represents the date 'to'. Accepts any of the custom list items for the specific App Field. To find the supported list items go to the Fields Page of the App in context. If the Select Field accepts multiple list items, you could separate the list items by using the pipe character ("|"). You can include [complete] or [incomplete] at the end of each item to set their status. If the status is not set, they are set as incomplete by default. The checklist items should be unique. If there are any duplicates, the text "(duplicate)" will be appended to the list item. E.g: "This is a completed checklist item [complete]|This has yet to be completed [incomplete]"
If the Link to User in context allows entries with multiple users, you could separate users by using the pipe character ("|"). If the Link to Role in context allows entries with multiple roles, you could separate roles by using the pipe character ("|"). When referencing records found within other Apps, you can only reference values of existing records. If you need to connect the inserted deliverables (as shown in the example) to their respected projects, just insert the Name of the project under the Project column. You could match a project using different Fields, just select the Fields from the available "Match by:" drop down (as shown below). If we find multiple project matches with the same Name, we will automatically connect the deliverable to the matched projects. You can use the pipe character ("|") to separate the records you wish to connect the record to. You cannot import values for Formula Fields. Values will be automatically computed for each record. Each Excel file cannot contain more than 3000 records (rows). We support both ".xls" and ".xlsx" files.